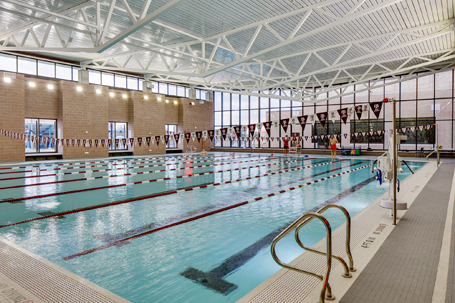 In 2017, Texas A & M University’s Student Recreation Center underwent a $54 million renovation and expansion to accommodate its growing student body, which now totals more than 50,000 students. The design for the 100,000 sq. ft. expansion and renovation consists of several new recreation spaces aimed to enhance the A&M student experience. The expansion includes a new fitness lap pool, double basketball court/soccer gymnasium, and doubling the size of the existing weight room. A new second floor banquet room opens directly onto a large outdoor plaza with views into the varsity baseball stadium. Each of the new spaces employs sustainable features such as natural daylighting, rainwater collection and retention, energy efficient mechanical equipment and low VOC materials. Renovation of the existing aquatic facilities included a new recirculation and water chemistry maintenance systems for the indoor 50-meter competition pool, diving pool, dive spa, general use spa, instructional pool, and outdoor leisure pool. The complete interior tile finish for all pools and spas were entirely re-grouted. New piping was installed throughout the entire pool recirculation system, and VFDs were installed for all pool pumps. The diving platforms were also resurfaced, and the diving Sparger system was replaced. 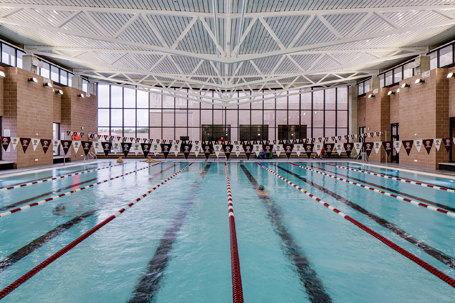 The expansion includes a new fitness lap pool featuring an eight lane, 25-yard shallow water pool, providing another option for members and guests to meet their aquatic workout needs. 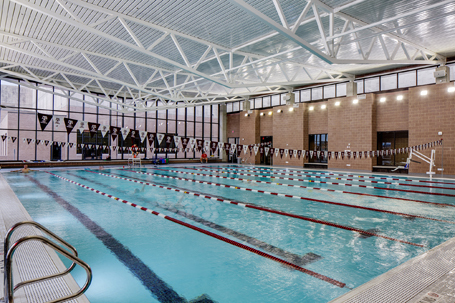 This pool will be an essential resource for all swimming activities including swimming classes for the Kinesiology Department and recreation swim, and will be especially useful when the competition natatorium is at capacity while hosting large swim meets.